This is the Shabby Tea Room Challenge for week 76. 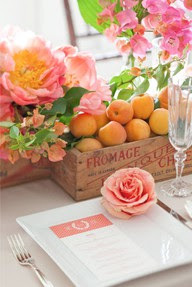 You must creat a card or project that uses pink, peach and green along with any neutrals. I have to say these are my favorite colors!! I started with some "Sweet Threads" from Basic Grey and some Melon Berry cardstock from PTI. I decided to ink up some new stamps from PTI that I just got in the mail! I made my own sunflower design on paper using various chalk inks and versa inks. I loved how it turned out! I then die cut the newly made paper with a scallop circle from Life Style Crafts. I framed that with more cream PTI cardstock. I die cut my leaves from Spellbinders "Foilage" dies. The challenge calls for a hand made flower which I made using another new die from PTI. Love how these dies make such 3-D flowers. The sentiment was stamped using the same stamp as the flowers called "Simple Sunflower." Hope you are having a great day! Here in Williamsburg, VA we are preparing for Hurricane Irene. Let's just hope it is not like Isabell! :) That one did not go so well here. I have prepared by filling propane tanks, buying water and batteries. We have a great deal of hardwoods in my neighborhood that are any where from 50 to 90 feet tall. When Isabell came through, we lost power for 7 days and could not get out of the neighborhood until we all got out and literally cut trees out of the way! Not hoping for that mess again!! Hope everyone stays safe.